The winning ticket was sold in Albany, New York. New York (CNN) -- A winning ticket purchased in upstate New York had the right numbers in Friday night's Mega Millions lottery, in which last-minute ticket sales increased the jackpot from $312 million to $319 million, according to the New York Lottery. The winning ticket was sold at Coulson's News Central in Albany, New York. Emanuel Biondi, public employees federation council leader for Housing Community Renewal, told CNN that the winning ticket was purchased by seven IT specialists from his department. He didn't disclose any other details. 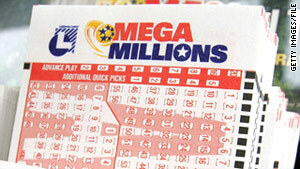 If they chose the cash option when buying the ticket, they would receive a one-time, lump-sum payment of $202.9 million. That amount reflects all the cash in the Mega Millions pool and is the sixth-largest jackpot in its history, according to New York Lottery spokeswoman Carolyn Hapeman. The owners of the winning ticket, who have yet to come forward, will be able to collect the prize money Monday morning in the Schenectady, New York, office, Hapeman said. CNN's Leslie Tripp and Cheryl Robinson contributed to this report.